With funding from Deutsche Bank, Facing History and Ourselves published Identity and Belonging in a Changing Great Britain—a timely resource that gives students and teachers a greater understanding of identity, membership, citizenship, and belonging in the United Kingdom. In a time when debates about national identity and integration have taken on increased urgency, Identity and Belonging in a Changing Great Britain reveals experiences of newcomers and the dilemmas surrounding immigration—from the individual to the collective—through memoirs, journalistic accounts, and interviews. 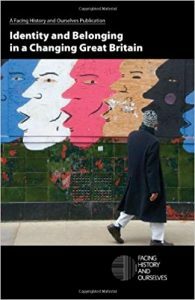 This is a critical and relevant resource for British educators in schools and other organizations that are addressing the duty to promote community cohesion. This is also an important resource for political science, sociology, education and religious studies courses at the university level. 15 readings that explore religion, migration, integration, and national identities.